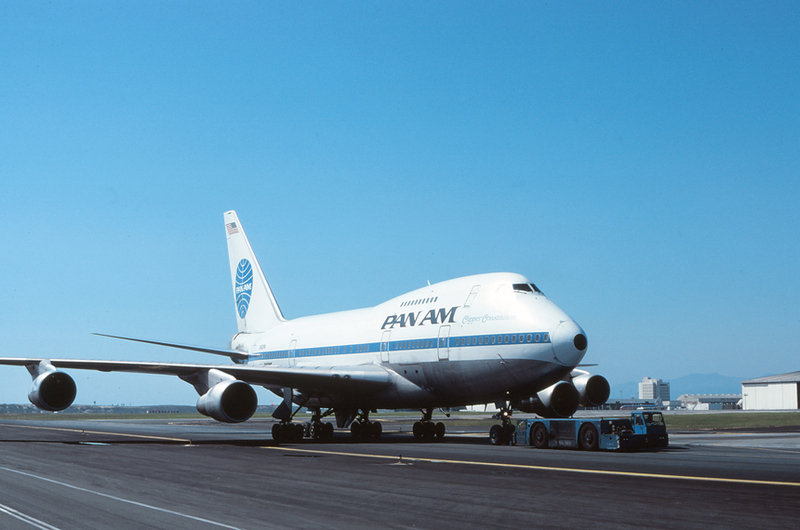 Pan Am, as the first customer of the "Special Performance" version of the Boeing 747, placed the plane on the ultra long-haul routes effectively connecting and conquering world-wide routes with a single flight. With a range of over 7,500 miles, the 747SP was a true intercontinental performer. Although initially envisioned for the lucrative New York-Tokyo route, the plane was placed on the Los Angeles-Sydney, Australia non-stop service in 1977, becoming the first airline to start non-stop service between the two continents and capturing the title of world's longest flight. Being pulled along Taxiway Foxtrot to a parking spot at the Imperial Terminal is N532PA "Clipper Constitution," a Boeing 747SP-21, delivered new to Pan Am on March 29, 1976. 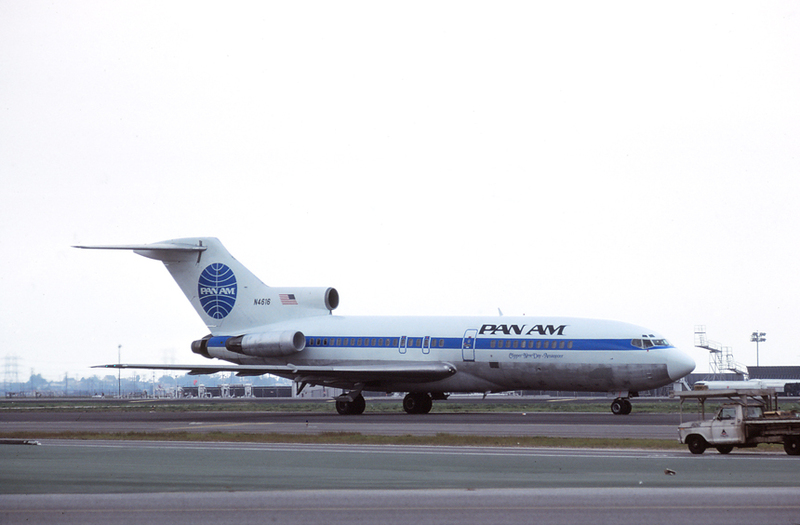 After the purchase of National Airlines in January 1980, Pan Am quickly began to repaint the existing National fleet into the familiar Pan Am colors. With the acquisition of National Airlines, Pan Am was able to provide a domestic route network from Los Angeles including five new cities to feed into its International routes from LAX. Taxiing to the Pan Am gates at Satellite Terminal 2 is N4616 "Clipper New Day-Amanecer," a Boeing 727-35, originally delivered to National Airlines in February 1965. Eastern Airlines, like many of the mainline carriers during the early 1970s, purchased the Boeing 747 for high-capacity, transcontinental service. It was quickly realized that the 747 was too big and within a few years Eastern disposed of their few Jumbo’s. Looking to fill the void, of an airliner with medium-range yet decent passenger loads, Eastern selected the “space-age” Lockheed L-1011 tri-jet wide-bodied transport. 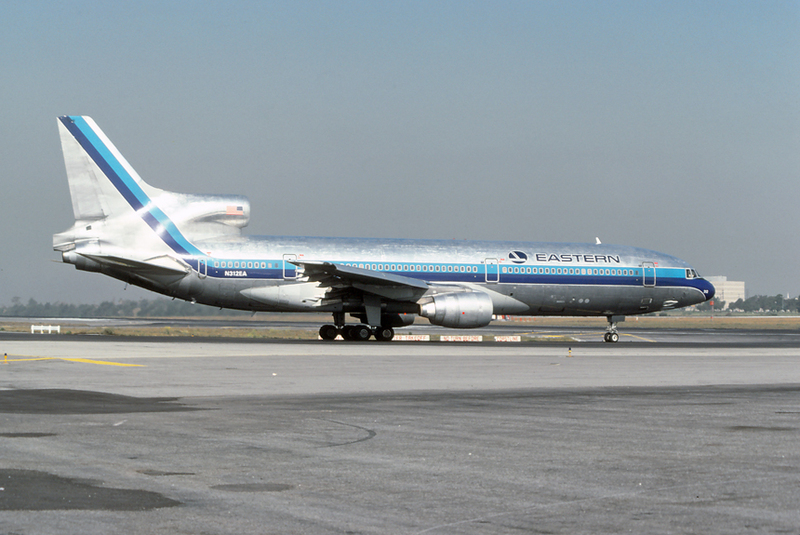 With a substantial order of fifty Tristars in April 1971, Eastern become the launch customer for the new airplane. There was some initial worry that deliveries could not be made due to the Rolls Royce bankruptcy (and the only engine certified on the L-1011) however this was initially resolved. Eastern received its first L-1011 in March 1972 and dubbed “Whisperliners” started service between Miami-New York via Atlanta on April 26, 1972. Within a few years, the L-1011 started transcontinental service from Atlanta to Los Angeles and would become the flagship, high-capacity aircraft for Eastern until its demise in January 1991. Holding short of Runway 24 Left for a morning departure to Atlanta is N312EA, a Lockheed L-1011-1 Tristar. 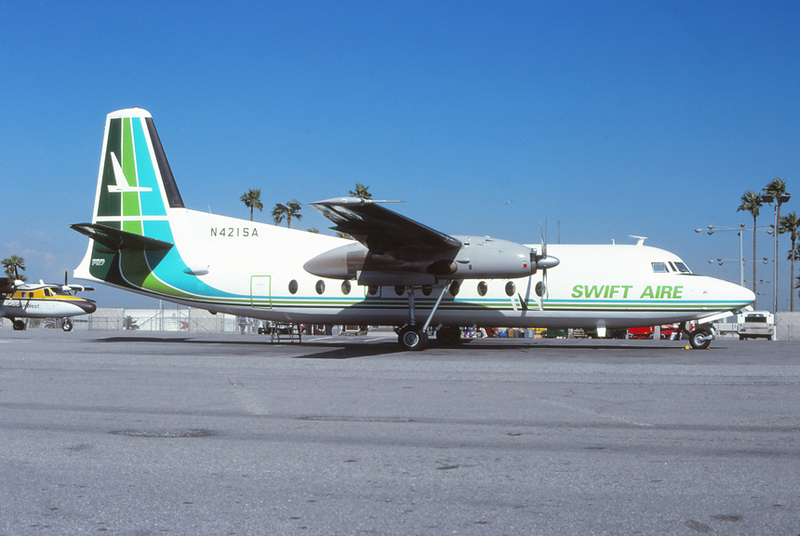 San Luis Obispo based Swift Aire took a checked sequence of growth from its humble beginnings in 1969. By 1979, the airline was starting to compete on routes with both established commuter carriers and regional airlines and required a larger capacity aircraft to remain popular. A decision was made to purchase three of the 50-seat turbo-props with the first two delivered in January 1980. The planes were used to replace the de Havilland Herons and placed on the higher capacity routes from San Luis Obispo to Los Angeles and San Francisco. Parked at the commuter ramp during an afternoon turnaround is N421SA, a Fokker F-27-600 "Friendship," and the first plane delivered to Swift Aire. By 1980, Western Airlines was operating forty of the Boeing 727 tri-jet with the plane making up the bulk of the short and medium ranged fleet. 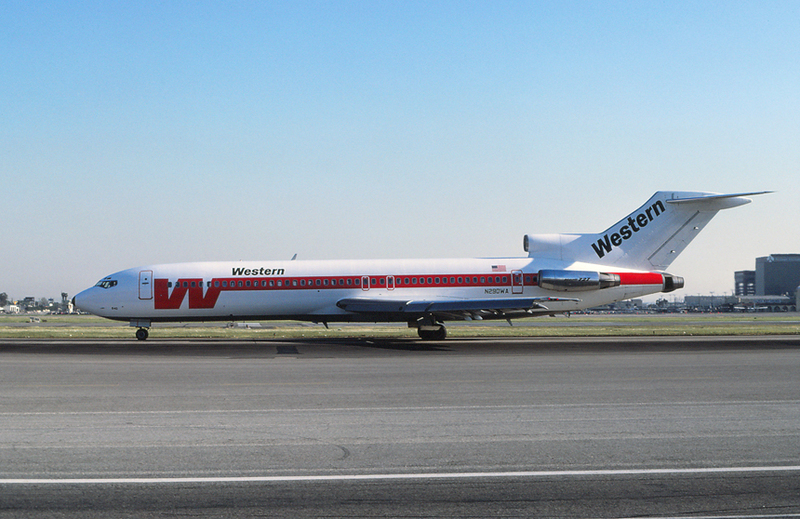 From Los Angeles, Western was using the 727 on flights as short as the 100-mile hop south to San Diego, to the 1600-mile international route to Acapulco, Mexico as well as to eight other cities served from the airport. Taxiing toward Runway 25 Right for an evening departure is N290WA, a Boeing 727-247, delivered new to the airline on June 19, 1979. The workhorse of the Golden West fleet was the rugged de Havilland DHC-6 Twin Otter was capable of flying into various regional airports within the Southern California area. 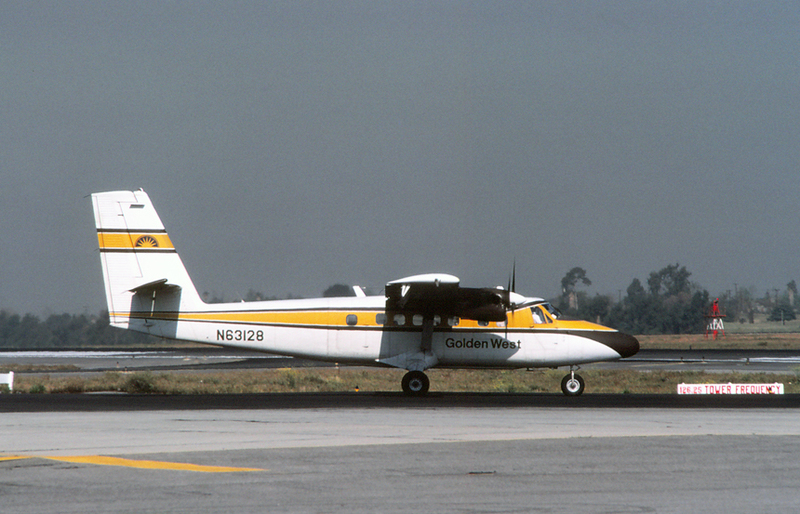 When Golden West was formed in 1969, the airline was flying a total of thirty-five Twin Otters. Although having been replaced by the larger Shorts 330 and newer de Havilland Canada DHC-7 Turboprops by 1980, the Twin Otter was still providing service to the smaller stations from Los Angeles such as Inyokern, Ontario, Oxnard, Palmdale, and Santa Barbara. Taxiing up to the hold-short point for Runway 24 Left and wearing the "earth-tone" colors introduced in the early 1970s is N63128, a de Havilland DHC-6-200. 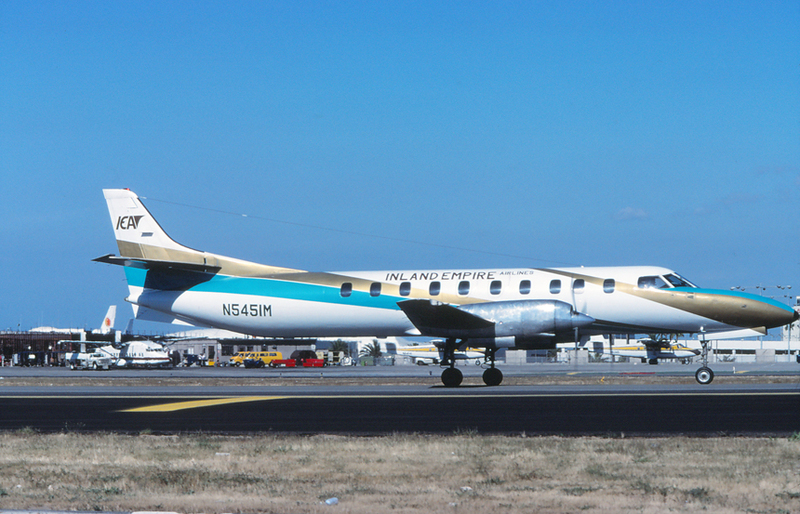 As a product of the new deregulation legislation, Inland Empire Airlines was formed in 1978, to start scheduled passenger flights from points in both central and southern California. Hoping to fill the void left by carriers such as Hughes Airwest, abandoning many smaller markets, Inland Empire with a fleet of four Metro turboprops provided commuter service from small cities such as Visalia and Ontario into Los Angeles. The airline eventually expanded north and provided services in the Bay Area at Both San Jose and San Francisco. Taxiing away from the commuter ramp for another regional flight is N5451M, a Swearingen SA-226TC Metro II. Renowned airline, Braniff International was no stranger to the Boeing 747 having operated the type briefly in the early 1970s. 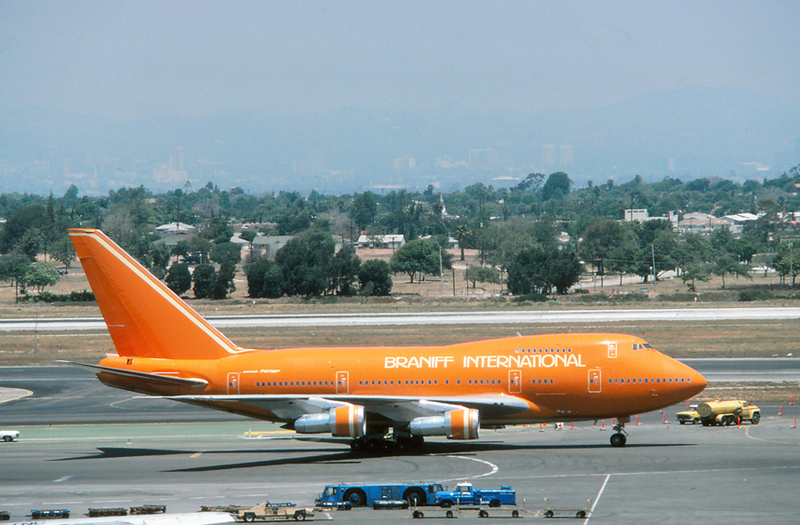 During the late 1970s, Braniff was awarded trans-Pacific service to Hong Kong and Singapore and decided to purchase four of the ultra-long range Boeing 747SP “Special Performance” variant of the legendary aircraft. The first aircraft was delivered on October 30, 1979, in a bright orange color scheme accented by yellow stripes followed by a second a few months later. Although initially placed on the Los Angeles-Honolulu-Guam-Hong Kong route, the new 747SP was also slated for a Dallas-Bahrain “Oil Route” that never materialized. Although the SP’s served Braniff well, after the delivery of the third in May 1980, high fuel costs and an economic recession which resulted in lower trans-Pacific traffic caused the airline to cancel its Pacific routes in May 1982. The three Boeing 747SPs were eventually sold and the fourth order was cancelled. Having just been delivered weeks earlier and turning in toward the gate at Terminal 3 is N606BN, a Boeing 747SP-27, delivered new to Braniff International on May 30, 1980. Cochise Airlines was one of the first carriers to receive official "Commuter" certification by the Civil Aeronautics Board (CAB) in 1971. The airline based in Tucson, initially started as a taxi and tour group operator before establishing schedule passenger flights within its home state of Arizona. In 1977 interline agreements were signed with various airlines at both Phoenix and Tucson and Swearingen Metroliners were ordered. Convair 440s were acquired in 1978 to increase service and eventually expand flights to El Centro, San Diego, Blythe, and Los Angeles in California. 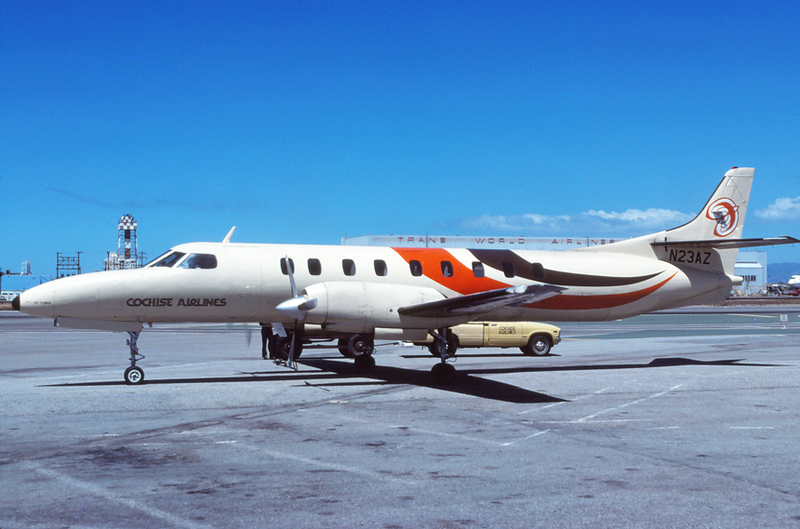 With the quick expansion and competition by other regional airlines, Cochise fell into financial difficulties and ceased operations in June 1982. Parked on the commuter ramp and awaiting taxi clearance for another flight to El Centro/Imperial Airport is N23AZ "City of Yuma," a Swearingen SA-226TC Metro II. 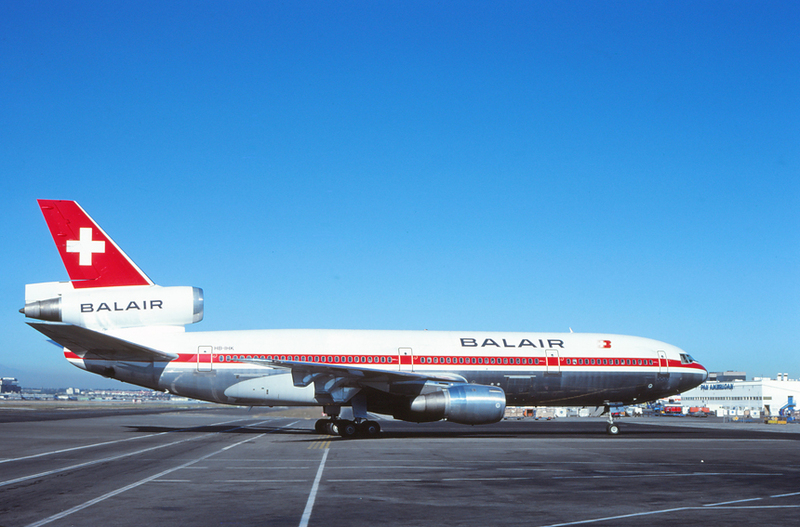 Balair was formed in 1953, as a flight school with passenger charter operations starting in 1957. With investment by Swissair, the Swiss government and other private interests, Balair become the largest charter airline in Switzerland. With a focus on tour groups for intra-European and intercontinental vacation packages, the airline could be seen throughout the world at holiday destinations. During the late 1970s, the airline ordered a sole Douglas DC-10 for increasingly popular tour group flights to North America. The DC-10 had the range and capacity to make non-stop flights from Switzerland to the U.S. West Coast as well as New York and Chicago. Los Angeles was a popular destination and companies DC-10 was seen frequently on charter services from both Zurich and Basel. Taxiing inbound into the Imperial Terminal complex on a bright summer day is HB-IHK, a Douglas DC-10-30, delivered new to the airline on January 31, 1979. Trans World Airlines (TWA) used the Boeing 707 as the foundation of its fleet from 1959, through the eventual retirement of the aircraft in 1983. The airline operated over one hundred-thirty various Boeing 707 variants and helped the global airline regain its standing as a reputable carrier. Los Angeles saw TWA's Boeing 707s operate a majority of services throughout the 1960s and 1970s on medium and long haul routes. 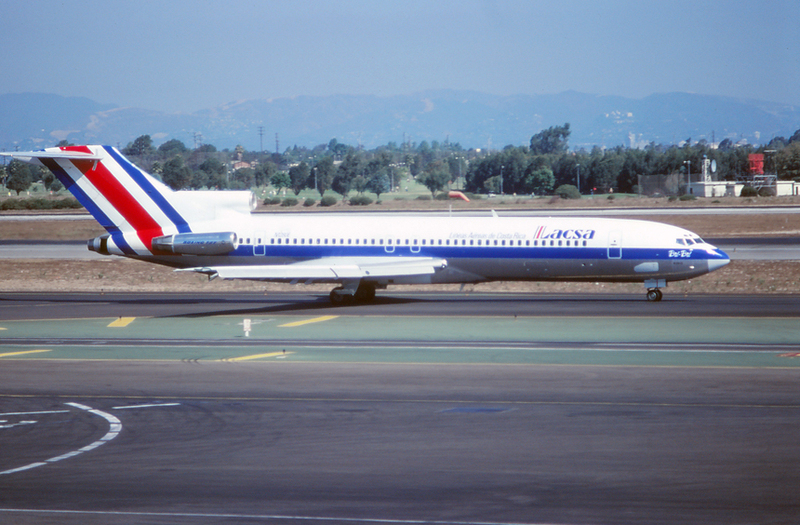 Although by 1980, even through the airplane was slowly being withdrawn from service, LAX still had service to nine cities using the venerable four-engine jetliner including Chicago, Newark, Oklahoma City, St. Louis, and San Francisco. Taking the active Runway 24 Left for a morning departure is N748TW, a Boeing 707-131B, delivered new to the airline on April 30, 1962. 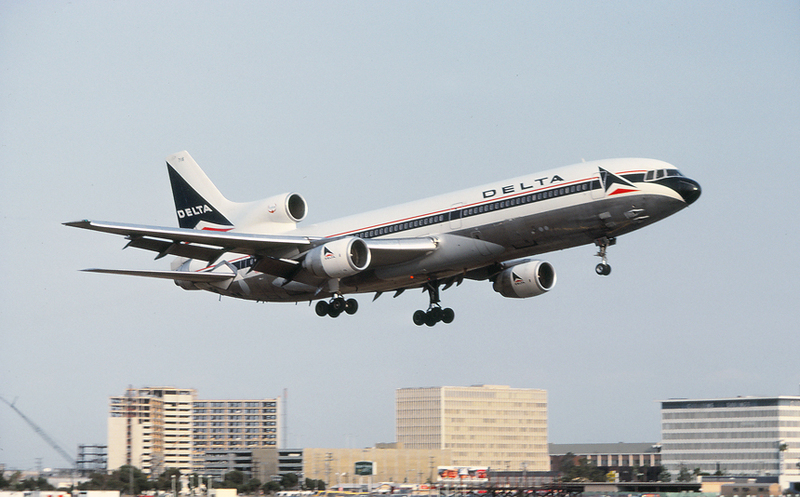 By 1980, Delta Airlines was operating twenty-nine of the Lockheed L-1011 Tristar and became the largest operator of the type world-wide. The L-1011 was used extensively from Los Angeles on both shorter segments such as flights to San Diego and San Francisco as well as longer routes to Atlanta and Dallas-Ft. Worth. Caught over the numbers for Runway 24 Right on a pleasant summer evening is N716DA, a Lockheed L-1011-193C Tristar, delivered new to the airline in November 1974. The national airline of Costa Rica, Lineas Aereas Costarricenses S.A. or LACSA was formed in 1945 as a joint venture between the Costa Rican government and Pan American Airways. For the next thirty years the airline provided flights from its San Jose, Costa Rica base to Panama City, Panama, Grand Cayman, Miami and Mexico City, using Douglas DC-6Bs and eventually starting "jet" service with the British Aerospace BAC-1-11 twinjet. During 1980, LACSA took delivery of two new Boeing 727s and extended routes across the Caribbean and South America. Los Angeles was added to the route network in July 1980, as an extension of its popular San Jose-Mexico City service. Taxiing outbound along taxiway Uniform for takeoff is N1280E "Bri-Bri," a Boeing 727-2Q6, delivered new to the airline a month earlier on July 10, 1980. Affectionately known as the "Flying Bananas" due to the striking yellow color scheme and using the catch phase, "Top Banana in the West", Hughes Airwest had become a large regional airline flying to over forty cities across the central and western portions of the United States with a fleet of fifty-one aircraft. By 1980, Los Angeles was being served by fifteen daily flights to eight cities including Edmonton, Canada. Only a month later would newly formed carrier Republic Airlines, purchase the assets and routes of Hughes Airwest on October 1, 1980. Climbing outbound into a blue-bird sky is N9344, a Douglas DC-9-31, delivered new to Hughes Airwest on September 4, 1969. The national airline of the island country of New Zealand, Air New Zealand ordered eight of the long range Douglas DC-10-30 for use on trans-Pacific, Far East and European services. 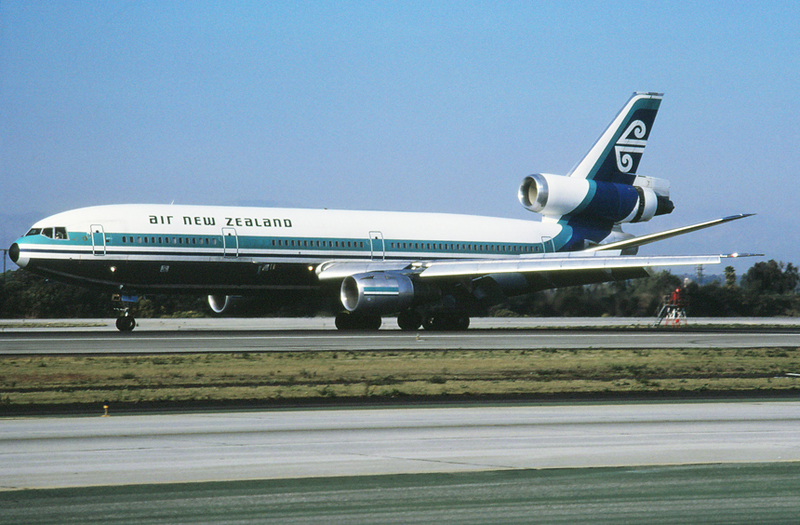 The first DC-10 was delivered in January 1973 and initially placed on the popular Auckland-Sydney route. In October 1973, the DC-10 replaced the DC-8 on the Los Angeles-Papeete-Auckland route and become the aircraft of choice on the famous "Southern Cross" service throughout the 1970s. With the introduction of the larger capacity Boeing 747 in 1981, Air New Zealand started to retire the Douglas tri-jets with the last one leaving the fleet in 1982. Rolling out on Runway 24 Left after a trans-Pacific flight is ZK-NZR, a Douglas DC-10-30, delivered new to Air New Zealand on October 2, 1975. During 1965, Britain's government controlled airline, British Airways was formed in April 1974, by the merger of British Overseas Airways Corporation (BOAC) and British European Airways (BEA). As part of BOAC's world-wide network, Los Angeles was added to the route map with non-stop service to London in 1961, (technical stop enroute at Montréal, Canada) using Boeing 707 aircraft. The service lasted only a few years until 1963, when flights were stopped. In 1968 service was reinstated to Los Angeles via New York City then to London. During that same year, BOAC placed an order for eleven of the new Boeing 747 Jumbo Jets with the first being delivered in April 1970. The new "Jumbos" were placed on the airlines more popular routes to North America, the Far East and Australia, including the non-stop services to Los Angeles. 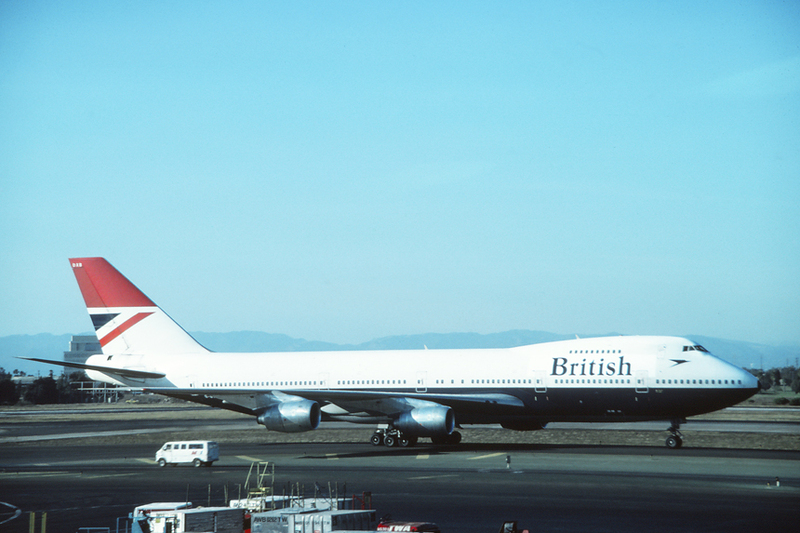 After the merger, British Airways continued to use the 747 on the daily Los Angeles-London flights. Having just landed and taxiing toward the International Arrivals at Terminal 2 is G-BDXB, a Boeing 747-236B, delivered new to British Airways on February 22, 1977. When Pan Am purchased National Airlines in 1980, the legendary carrier acquired much coveted domestic US routes, that had traditionally been awarded to other airlines prior to airline deregulation. With the purchase, Pan Am took over the sixteen Douglas DC-10 airplanes that were being operated or on order by National. 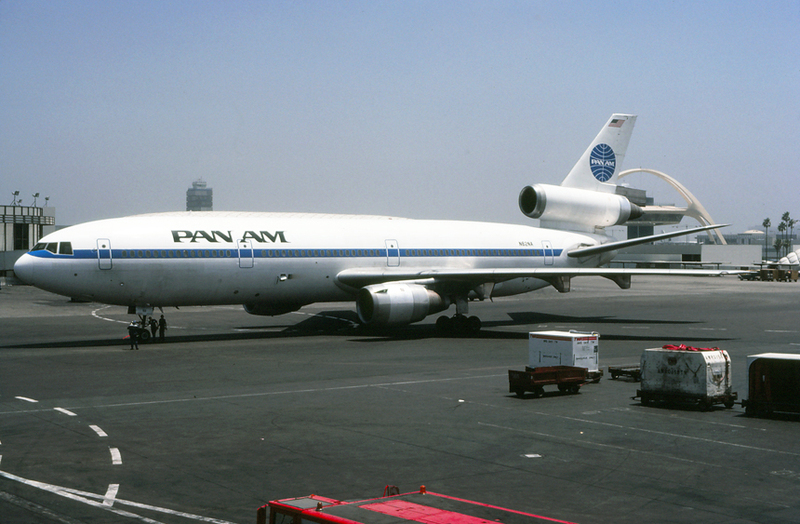 Although, Pan Am was already operating the Lockheed L-1011, the Douglas DC-10s provided the needed capacity on the new routes assumed, including on services from Los Angeles to Miami and Houston. Wearing the familiar colors of its new owner and having just been pushed back from Terminal 2 is N62NA, a Douglas DC-10-10, delivered new to National Airlines on December 21, 1971. 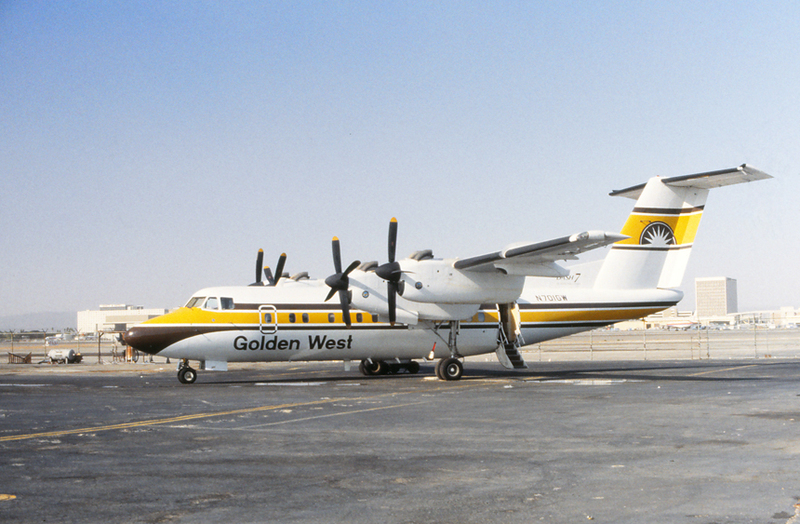 Golden West Airlines, seeing growth in its regional market due to deregulation and the plan of longer routes ordered five of the new de Havilland Canada DHC-7, four-engined turbo-prop. With the capability to operate in Short-Takeoff-Or-Landing (STOL) configuration, the new plane was seen as a solution for local airports in the Southern California region. The first plane was delivered in March 1980, wearing the "earth-tone" colors of brown and yellow introduced with the airlines delivery of the Shorts 330 in 1977. Early services saw the plane used on the more popular Los Angeles-Santa Barbara, Los Angeles-Orange County, and Los Angeles-San Diego routes. Parked at the Golden West maintenance ramp on the south side of the airport is N701GW, a de Havilland DHC-7-102 "Dash 7," delivered new to the airline on March 28, 1980. 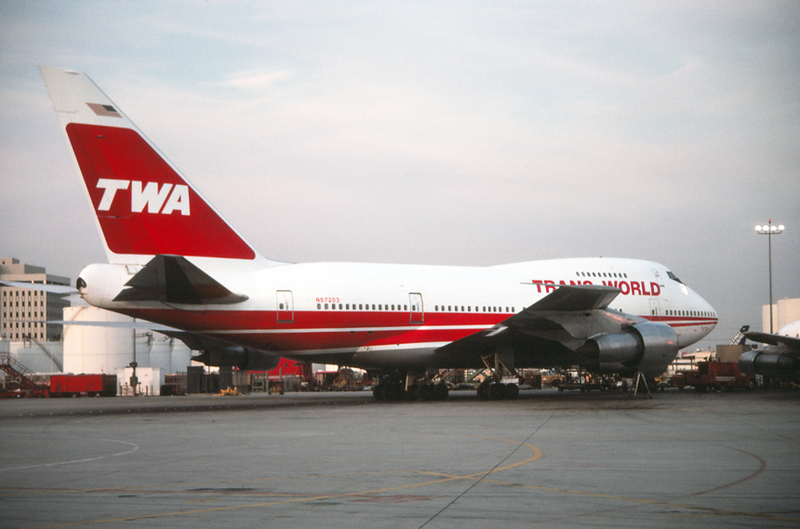 Trans World Airlines (TWA) had a close relationship with Boeing, especially with the manufactures successful Boeing 747 Jumbo Jet. When Boeing introduced its "Special Performance" version of the legendry aircraft, TWA wasn't initially interested in a purchase. With the possibility of routes to the Middle East, TWA saw the super-long distance 747 as a solution to non-stop flights from Eastern Seaboard cities to the Middle East. 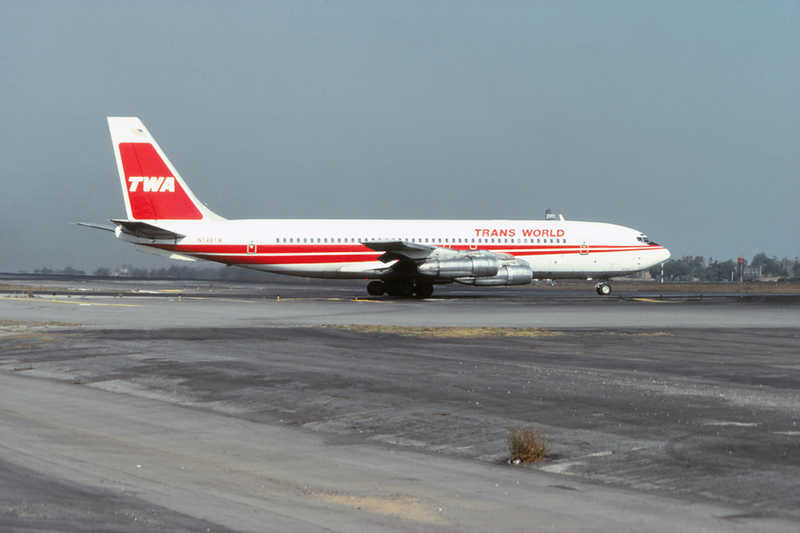 TWA ordered three aircraft in 1978, however the routes to the Middle East never materialized. The 747SP was used however on some trans-Atlantic and trans-continental routes such as Los Angeles-New York before operating economics had TWA retire the plane in 1986. Parked at the TWA maintenance ramp on the west side of the airport is N57203, a Boeing 747-SP31, delivered new to TWA on May 8, 1980. Los Angeles was the last major airport in Southern California that Orange County based Air California had yet to add to its route network. 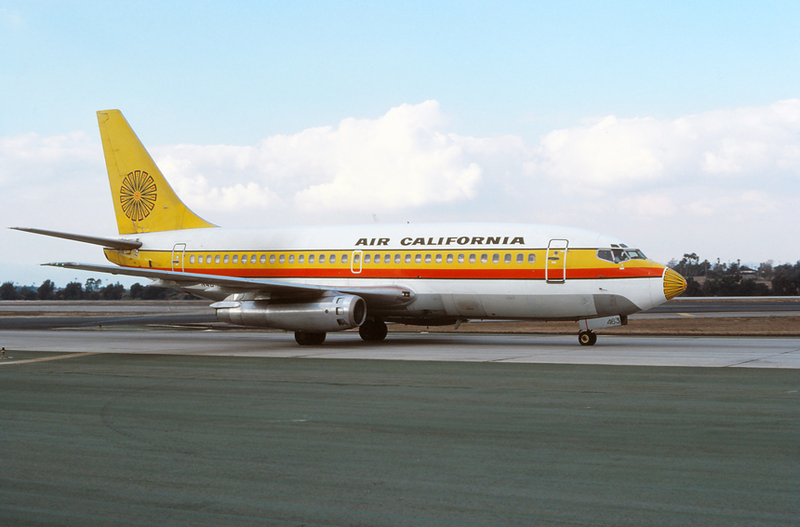 Los Angeles was much sought after however many regional airlines had established service and passenger bases at the airport years prior such as Air California's main intra-state competitor, Pacific Southwest Airlines (PSA). To establish a foothold, Air California accepted route awards to secondary cities, Fresno and Monterey for which the main-line carriers had departed. These new flights started in July 1980, and allowed entry into the lucrative LAX airline "fraternity." Taxiing toward Terminal 3 after having landed is N463GB, a Boeing 737-293, originally destined for Pacific Airlines and not taken up then bought GATX-Boothe Aircraft and leased out to Air California on July 10, 1968.